The Center for Experiential Learning & Diversity (EXPD) is pleased to announce Spring Quarter introductory workshops on developing Integrative Knowledge E-Portfolios. Provide you with resources for creating your e-portfolio. Join us and learn how to showcase your learning in connection with real-world experiences! RSVP at https://expo.uw.edu/expo/rsvp/event/428, though drop-ins are always welcome! Additional information is available at http://expd.washington.edu/eportfolio. Join us and learn how to showcase your learning in connection with real-world experiences! RSVP at https://expo.uw.edu/expo/admin/events/428, though drop-ins are always welcome! The UW Information School will be holding our annual Capstone event, showcasing the work of graduating Informatics, MSIM and MLIS students. Where are the next great ideas in the information field coming from? This year’s Capstone event may provide some answers. Capstone projects from the iSchool’s Bachelor of Science in Informatics, Master of Science in Information Management and Master of Library & Information Science programs are concrete examples of what it means to design and build novel applications of technology and innovative information tools and services. Capstone students provide solutions to information problems that people and organizations face every day, with projects ranging from mobile device applications to web-based library collection tools to browser security plug-ins. All are welcome to attend – industry professionals and employers; UW and iSchool alumni, students, faculty and prospective students; and family and friends of the presenting students. Guests are asked to RSVP for the Capstone Event at http://bit.ly/capstone12. A special thanks to our 2012 Capstone Presenting Sponsors – Yahoo and Intelius! 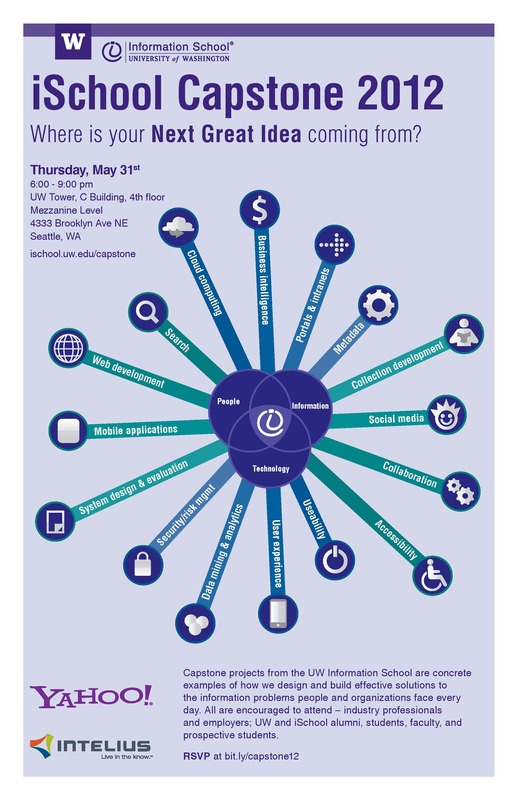 Reminder: iSchool Capstone Event tonight at UW Tower! Reminder: The University of Washington Information School 2011 Capstone Event is tonight, Thursday 6/2 @ 6:00pm at UW Tower. Capstone projects from the UW Information School are concrete examples of how we design and build effective solutions to the information problems people and organizations face every day. The Information School Capstone Event showcases projects from the University of Washington Information School’s Bachelor of Science in Informatics, Master of Science in Information Management (MSIM), and Master of Library and Information Science (MLIS) programs. The evening begins promptly at 6:00 pm with “Information Overload,” a lively round-robin of project introductions. Following is an evening of poster presentations, networking and hors d’oeuvres. Guests are invited to see how iSchool students have been using information as a tool for transformation in their academic, professional and personal lives. Capstone project collaborators include organizations from the public, private and non-profit sectors. Intelius is a leading i-commerce company and we understand the impact information will have on our personal lives and the global economy. We take our leadership responsibility seriously as we empower both individuals and businesses. We are proud of our innovative partnership with UW’s iSchool.